Will.I.Am Uses Illegal Samples in New Song. Over the last day or so, Will.I. Am’s YouTube channel has been posting new material from the ex-Black Eyed Peas frontman. One of the new songs, a collaboration with Chris Brown entitled “Let’s Go” (F- for creativity on that one) appears to sample note for note a song released by trance producers Arty and Mat Zo, named Rebound. 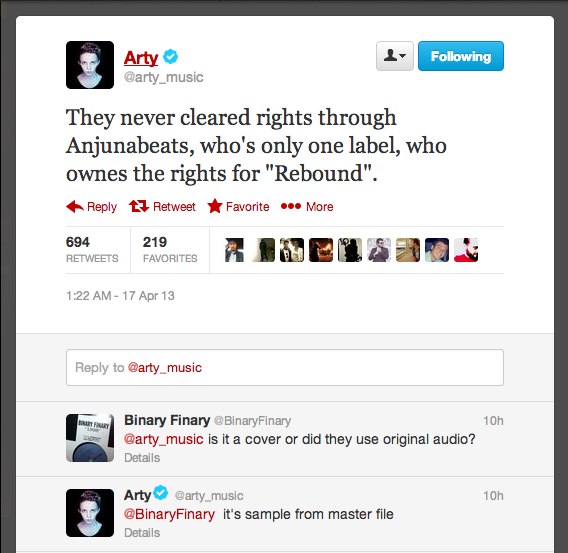 According to tweets posted by Arty himself, the samples were taken directly from his master file without his consent or permission, or without acquiring any rights from his record label, Above & Beyond founded AnjunaBeats. Meanwhile, EDM fans and #TranceFamily members worldwide have made clear their disgust at Will.I.Am, unloading a barrage of hatred at the artist, prompting even Mat Zo himself to tell his fans to cool off. You can see the video’s and compare for yourself here. Next Article BREAKING NEWS: Supafest is 99% OFF.